Can an ICT-based training program help improve financial outcomes for women entrepreneurs? 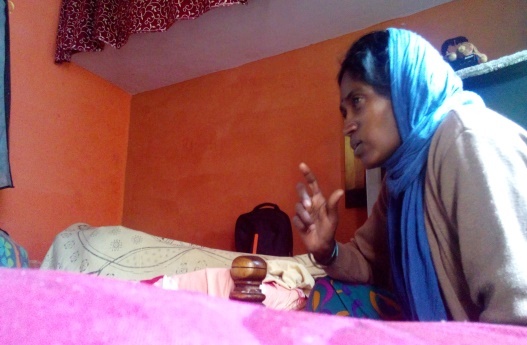 In this article, Kanika Joshi gives us an insight into the life of Shakuntala - a woman entrepreneur and participant in our ongoing evaluation of a mobile-based business training platform in Karnataka. Kanika is a Research Associate with the MSME & Entrepreneurship Development vertical at IFMR LEAD. Pursuing funding agencies to sponsor research projects is an arduous task. It’s not easy to make the donor see the social impact a project seeks to achieve, and how it aims to go beyond knowledge creation. We often assess project impacts in numbers because, well, that makes the data more credible. However, what is rather disappointing, after having gone through such a backbreaking process, is how we get so caught up with numbers, that we end up overlooking the people who make that data. IFMR LEAD is currently conducting a project in Karnataka that delivers financial training and business advice to MSME’s through a mobile platform. Shakuntala, a recipient of such training, provides an interesting case study for us to better understand the dynamics of mobile based training. Such encounters also help researchers like us in harnessing our potential to motivate the treatment group by bringing about financial literacy among clients in the long run. Having mentioned that, it has been clear to us that the right kind of knowledge and access to resources can help ventures make positive decisions. Shakuntala is derived from the Sanskrit word, saakunta, referring to birds. In Hindu mythology, she was found in a forest protected by birds. She lived in the privacy of the wilderness where she met and married King Dushyanta. After a curse was laid upon them, Dushyanta lost his memory and they were separated, but eventually the curse was broken after Shakuntala showed the king a ring he gave her. Our Shakuntala is different but equally special. She isn’t poor, she isn’t rich. She is not living in luxury nor is she dissatisfied. She is a petite 45 year old lady who has been working in the flower business for 20 years now. She completed her middle school education and started a flower business at the tender age of 12. Often the marginal have paid the price for development; however, some do not complain and continue with their hard work. Shakuntala is a prime example of such people, who armed with her motto of “No one should waste time!” has refused to sit idle, but instead, struggle and strive towards expanding her business. Although residing in a small house, her space was clean, neat and not lacking in any basic necessities. Clad in her shawl with a smile on her face, and a glint of hope in her eyes, she sat down excitedly to tell us her story. She used to travel by tanga, a horse sledge, back then with her parents to sell flowers and cover the distance till the market. Here she met her husband who also worked in the same shop. They started working in the market and were doing well until a decade ago, when the market was wiped out and they had to stop the work. Their houses were demolished to expand the city market and they were resettled to Vivek Nagar. IFMR LEAD is working with Janalakshmi, implementation partner of the Financial Heuristics project, to provide free mobile based financial training to small businessmen. 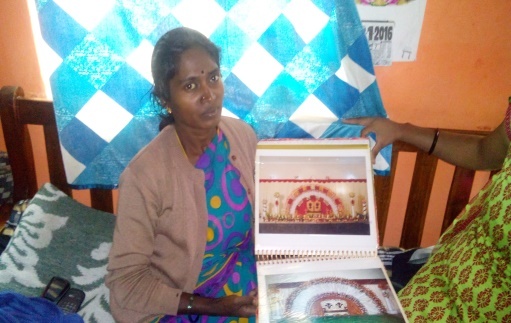 Last year after receiving free mobile based business training service from Janalaksmhi-IFMRLEAD, Shakuntala followed the advice given to her by the programs and instantly found a lot of difference in her business. Prior to the training she had a collection of pictures of their work, but after the training, she started maintaining a new album to showcase all their achievements and orders attracting more clients. The training motivated her to prosper in her business. She received only a few training messages, and strongly recommends that the training should include content on skill development and motivation as she feels that these two are lacking in her counterparts. The couple originally had started with Rs 2000 investment and two name boards i.e. a signboard installed for the convenience of customers to identify a shop. Now they have expanded to five name boards and get 4 orders per month for which they charge Rs 8000, thus making their monthly income of Rs 20,000. Her work includes buying the flowers daily from the market, segregating them and preparing the flower decorations. She further hands them over to her husband who arranges them. She pays a sum of Rs 5000 to ten people who work under her out of the Rs 8000 that she gets per order. Compared to last year, this year during the festive season of Ramnavmi, she was busy with many orders; making her feel happy about the fact that she gave jobs to others as well as made good profit. Last month, she had a major surgery, which meant that she was unable to support her husband in the business. This in turn affected the overall household earnings. She had to spend Rs 40,000 on her medical health issues. The doctors even warned that she lacked a proper diet and intake of adequate food. She still did not rest even for one day resulting in severe complications. She now, allocates and supervises jobs, earning Rs 200 per day. All lives have struggles, why is this one special, you might wonder? No data can do justice to her struggle, the sheer exhaustion and pain of her everyday life, and the smile she carries with all her heart despite of the business. One cannot deny the implausible impact that a microfinance institution and these trainings have on people, which have become torch bearers for social change. Rather than inspecting a social inferno, through these projects we create journeys from helplessness to hope. It feels good being part of a project if it is supporting someone in their day to day lives. The role a mobile based consulting service can have is fascinatingly critical to the lives of people during trying times. Thus, we should strive to explore innovative ICT strategies that may help small businessmen prosper. This project is an RCT based study with a treatment and control group of 1200 each. The treatment group receives the mobile based financial/business training unlike the control group.